Today marks the beginning of the Year of the Goat (or Sheep, or Ram, depending on who you speak to). 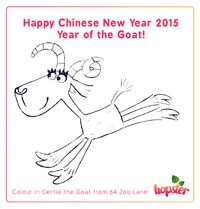 We’ve put together a fun 64 Zoo Lane colouring sheet and Chinese symbols tracing sheet for your little one to get in the mood for the festivities! Goats are said to prefer peace, be most comfortable at home, and artistic but resistant to change. A goat’s lucky numbers are 3, 4 and 9, and they’re best matched to Rabbits, Horses or Pigs, apparently. If you’re a goat, have you found yourself nodding in agreement with this assessment? Even though many people think the Dragon is the coolest of the Chinese Zodiac animals, you’re actually in very good company as a goat. Bruce Willis, Julia Roberts, Michelangelo, and Leonardo Da Vinci are all goats too! 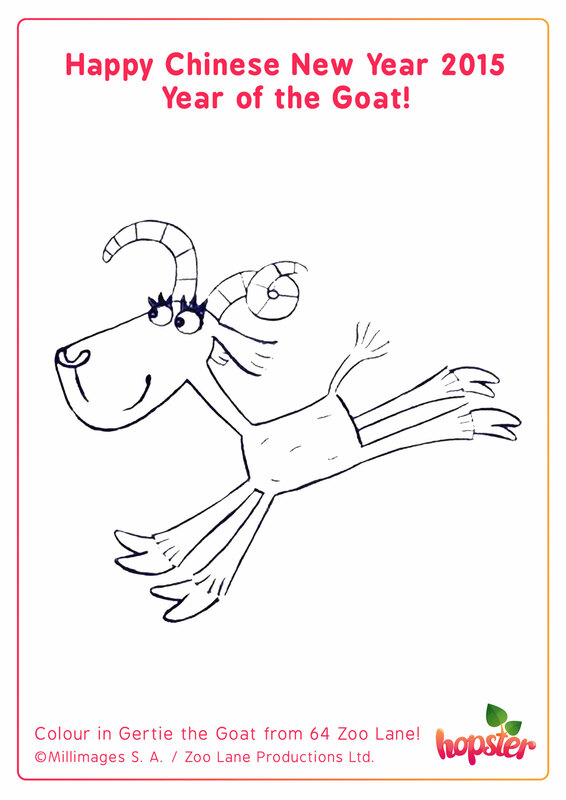 One of our free episodes this weekend on Hopster is the story of Gertie the Goat, set in the lovely animal world of 64 Zoo Lane. Once you’re done colouring Gertie in all sorts of fun colours (and have uploaded your kids’ creations to our Facebook page), check out An Vrombaut’s website for more fun colouring sheets – they rock! 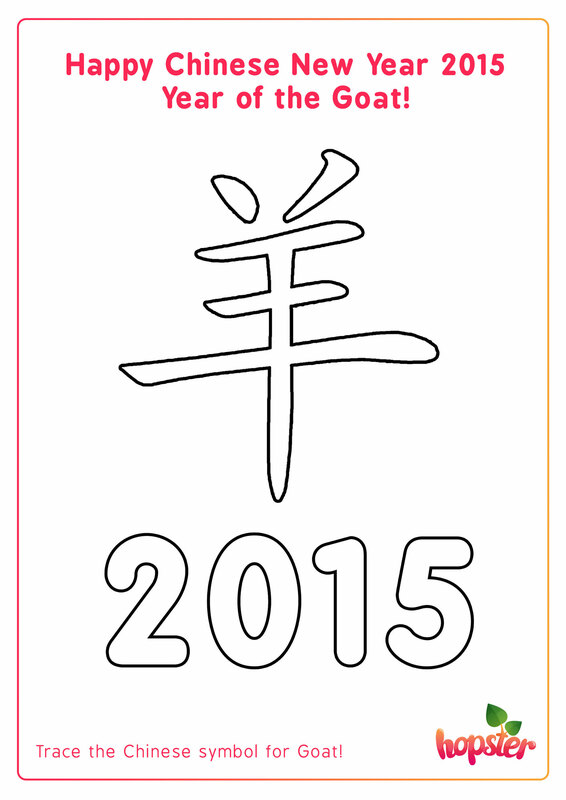 Did you know that Mandarin Chinese is written in symbols called Chinese characters? These characters represent the oldest writing system in the world and with some imagination, you can see where they got the inspiration for the characters from – can you spot the goat in the symbol to the left? Want to know more about goats, sheep, and rams? Check our free episodes! 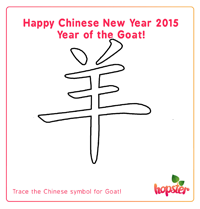 This weekend, we’re celebrating Chinese New Year on Hopster with four beautiful sheep-centric episodes. 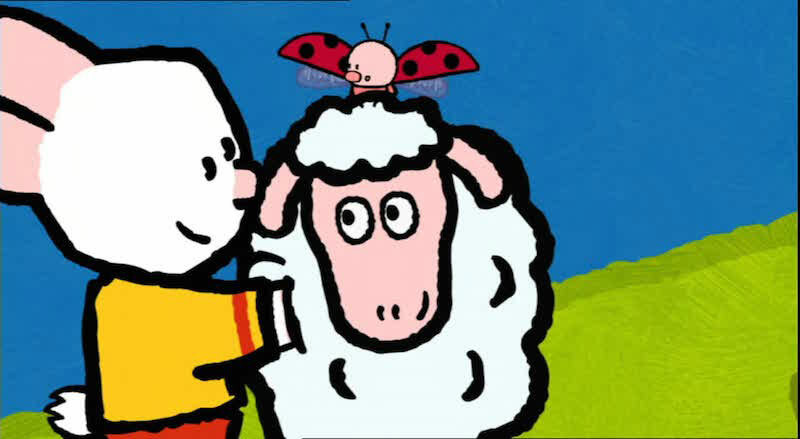 Learn how to draw a sheep with Louie, find out what’s bothering Gertie the Goat on 64 Zoo Lane, sing Baa Baa Black Sheep with Nursery Rhymes TV, and follow Tractor Tom‘s adventure with a little kid (which is what you call a baby goat!). If you haven’t tried Hopster before, now’s a great time to give it a go! Download it for free now. Then continue for as little as £3.67 / month. Cancel online anytime.